Recipient of a Christianity Today 1993 Critics' Choice Award! Now in paperback! Stanley Grenz and Roger Olson offer in this text a sympathetic introduction to twentieth-century theology and a critical survey of its significant thinkers and movements. Of particular interest is their attempt to show how twentieth-century theology has moved back and forth between two basic concepts: God's immanence and God's transcendence. Their survey profiles such towering figures in contemporary theology as Karl Barth, Rudolf Bultmann, Dietrich Bonhoeffer, Reinhold Niebuhr, Paul Tillich, Jurgen Moltmann and Wolfhart Pannenberg. It critiques significant movements like neo-orthodoxy, process theology, liberation theology and theology of hope. And it assesses recent developments in feminist theology, black theology, new Catholic theology, narrative theology and evangelical theology. An indispensable handbook for anybody interested in today's theological landscape. Stanley J. Grenz (1950-2005) received his D.Theol. at the University of Munich, where completed his dissertation under the supervision of Wolfhart Pannenberg. Grenz worked within the local church context as a youth director, assistant pastor and pastor, in addition he preached and lectured in numerous churches, colleges, universities and seminaries in North America, Europe, Africa, Australia and Asia. From 1990 until his unexpected death, Grenz held the position of Pioneer McDonald Professor of Baptist Heritage, Theology and Ethics at Carey Theological College and at Regent College in Vancouver, British Columbia. 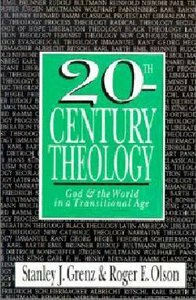 Grenz wrote or co-authored twenty-five books, the most recent of which is Rediscovering the Triune God: The Trinity in Contemporary Theology (2004). His other books include The Social God and the Relational Self: A Trinitarian Theology of the Imago Dei (Westminster John Knox), Beyond Foundationalism: Shaping Theology in a Postmodern Context(with John R. Franke; Westminster John Knox), The Moral Quest: Foundations of Christian Ethics (IVP), A Primer on Postmodernism (Eerdmans), Women in the Church: A Biblical Theology of Women in Ministry (with Denise Muir Kjesbo; IVP), Revisioning Evangelical Theology: A Fresh Agenda for the 21st Century (IVP), and The Millennial Maze: Sorting Out Evangelical Options (IVP). Roger E. Olson (Ph.D., Rice University) is professor of theology at George W. Truett Theological Seminary of Baylor University in Waco, Texas. He is the author of The Story of Christian Theology: Twenty Centuries of Tradition and Reform, The Mosaic of Christian Belief: Twenty Centuries of Unity and Diversity, and the editor of The Westminster Handbook to Evangelical Theology He is also co-author of 20th-Century Theology: God and the World in a Transitional Age and Who Needs Theology? An Invitation to the Study of God (both with the late Stan Grenz.